The XP-13 Viper was a prototype biplane fighter aircraft designed by the United States company Thomas-Morse Aircraft Corporation. The airplane was delivered to the United States Army in 1929. 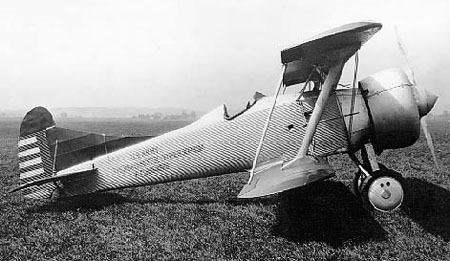 This aircraft was one of several B. Douglas Thomas designs built in hopes of a production contract from the Army, following the successful Thomas-Morse MB-3 of 1919. Financed by the company, and named the "Viper", it was officially purchased by the Army in June of 1929 and designated "XP-13". The XP-13 fuselage had a corrugated aluminum skin built over a metal frame; the flying surfaces were also metal-framed, but covered with the traditional fabric. While designed to use the 600 hp Curtiss H-1640-1 Chieftain engine, (a novel 12-cylinder two-row air cooled radial with the rear cylinders directly behind the front cylinders rather than staggered as normal in a two row radial) for which the XP-13 incorporated a complex system of baffles to direct cooling air over the engine, the engine simply would not stay cool enough, and in September 1930 it was replaced with a Pratt & Whitney SR1340C Wasp of 450 hp. Ironically, the lower-power engine actually resulted in a speed increase of 15 mph, at least partly because of the weight savings. In the end, the Army decided against production, Thomas-Morse was acquired by Consolidated Aircraft, and the prototype was lost to an inflight fire. Data from "The Complete Book of Fighters" cover Editors: William Green & Gordon Swanborough (Barnes & Noble Books New York, 1998, ISBN 0760709041), 608 pp. 1. "The Complete Book of Fighters" cover Editors: William Green & Gordon Swanborough (Barnes & Noble Books New York, 1998, ISBN 0760709041), 608 pp. 2. a b "U.S. Army Aircraft 1908-1946" by James C. Fahey, 1946, 64pp. Dorr, Robert F. and Donald, David. Fighters of the United States Air Force. London:Temple, 1990. ISBN 0 600 55094 X.
Gunston, Bill, World Encyclopedia of Aero Engines.London:Guild Publishing, 1986.